Holding pattern | carpe diem! In many ways. My in-laws were to have left today, but my father-in-law was poorly when they arrived and was hospitalised in a frantic rush that lasted 12 hours on Thursday. These were the travelling socks that day; I’ve put them aside to wait for happier times. I want to enjoy wearing them, not be reminded of hours spent sitting in Emergency Assessment. He’s improving, out of Intensive Care this morning, but I’d guess they won’t be flying home on Friday. I feel a growing need to lose myself in complex lace, a pattern that demands concentration. How about a Swallowtail Shoulder Shawl? I’ve never done nupps. It’s true: yarn is sometimes better than chocolate. This is Marisilk, a sea silk from Das Schneeshaf (access the shop via the button at top left). I lack words to tell you how utterly beautiful some of Andrea’s colours are. This is NOT grey: it’s a pale bronze/gold-grey and I love it. It’s air-brushed! It’s gorgeous. 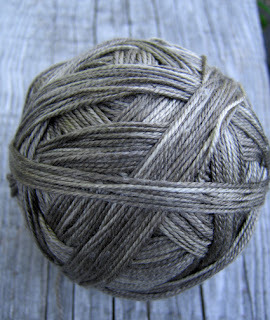 I have another skein, a mixture of true greys as well. And some sock yarns. I was her first international customer and I wish I had a louder voice because her yarns deserve to be better-known. Or maybe not. Maybe I shouldn’t tell anyone. Let’s keep this a secret known to the favoured few, shall we? Yes, that’s my handspun alpaca/silk. It’s going to be the Wool Peddler’s Shawl from Folk Shawls, started in part because I needed to show my mother-in-law how four yarnovers/row force the shaping of a triangular shawl. Why? Because she’s never knitted lace before. I gave her 1500 yds of Wollmeise superwash lace yarn in Rosenrot (dark). I’d meant it to be a gift to take home but, with her own copy of Seraphim and an Addi lace circular, it’s become a welcome distraction. Medicinal yarn: apply as needed. This entry was posted in Uncategorized on August 5, 2007 by sarahw. Dear Sarah, all best wishes to your father-in-law for his successful recovery. I’m certain yarn and projects of this quality will help you cope as you wait. Oh, I’m so sorry to hear all this! However, you are right–yarn and knitting are good medicines. Beyond that, you are fortunate (in a way) that your in-laws were visiting you when this happened. It would be much harder if your father-in-law was far away and you were unable to visit or help out while he was ill. At least, that’s the positive side to this situation. I am thinking of you! Thinking of you and your family and sending positive thoughts for a fast recovery to your father-in-law. If yarn alone could make all things better I’m sure you have a winning combination there. I hope that your FiL is now well on the road to recovery & that yarn therapy played a vital role in providing family support. 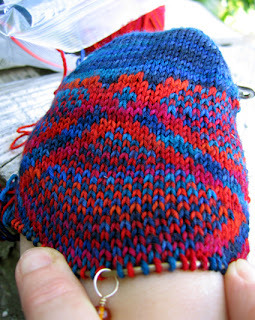 The Gairloch socks are real eye candy but not theraputic knitting unless you really need to shut the world out. The Pedlars shawl was one I dismissed on first view but I have looked at it again over the last two weeks & decided that it would work for the right yarn & it looks like you have spun the right yarn! I hope this week gets off to a better start and that the medicinal yarn has had the desired effect. 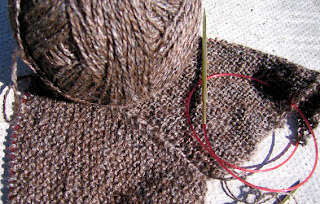 The garter sections of the wool peddler’s shawl should be soothingly mindless. I’m sorry to read your father in law hasn’t been well. I hope he recovers soon, and that you and your husband are holding up well. It sounds like you are applying all the right knitting medicine and so everyone will feel a little better soon. I’m not normally a fan of neutral yarns but that gray is gorgeous!